Either this denial is disingenuous, or Johnny T. doesn't see what is staring him in the face, which latter I assume to be the case. For Scientologists tend to be people who take for granted Hubbardian assumptions about the world, however strange they may seem to the rest of us. 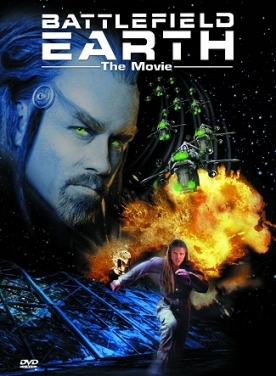 The principal such assumption on display in Battlefield Earth is that human consciousness and will is a universal solvent for all external realities, no matter how oppressive or frightening. This assumption, only an extreme version of one common on the therapeutic fringe, was the foundation of Hubbard's fortunes, both in his science fiction and in his self-invented “religion.” As in Scientology so in this film there is a wonderful machine which turns ordinary people into supermen, able to do or be anything their hearts desire. It's the contemporary equivalent of the philosopher's stone. Unlike the Scientology machine, however, this one, the property of the evil Psychlos of the Planet Psychlo, is free. Or at least it is free for Jonnie Goodboy Tyler (Barry Pepper), whom for reasons that remain obscure Terl (Mr Travolta), the Psychlo head of security on the planet formerly known as Earth, favors with a few brief but highly charged sessions on it. Jonnie just looks into the machine and is zapped with lightning bolts to the eyes, which subsequently prove to have carried into his brain (and with no apparent harm to the intervening tissues) all Psychlo knowledge, including knowledge of their language. Sure beats going to school for years. Cheaper too, probably, even if Terl, like the late Mr Hubbard, had chosen to charge for his treatments. With the newly implanted knowledge, Jonnie is able to lead a handful of savages and cave-men (which is what the human race has been reduced to) clothed in rags and without the slightest understanding of any weapon more sophisticated than sticks and stones to a successful military engagement against the hitherto invincible Psychlos. In the space of a week this little bunch of technological innocents learn how to operate Harrier jump jets and other high-tech military hardware and so defeat an interplanetary army which, some years before, had annihilated Earth's resistance to its takeover of the planet and enslavement of its populace in nine minutes. How did this stunning reversal take place? Because of something that looks suspiciously like Hubbardian mind-control. Compared to this fantasy, that of the star-wars weaponry, lifted from merely bad science fiction movies, is believable. But compared to the noxious sorts of propaganda being swallowed every day by the (mostly) teenage consumers of Hollywood “entertainment” it is, perhaps, only marginally worse.